The Wedge of Aiud Mystery! - Ancient Explorers The Wedge of Aiud Mystery! 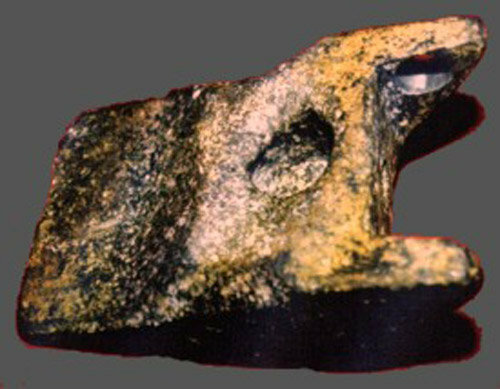 The Aluminum Wedge of Aiud is a wedge-shaped object found two kilometers east of Aiud, Romania, on the banks of the Mures River in 1974. The object was reported to be unearthed 35 feet under sand and alongside two mastodon bones. A mastodon is an extinct large tusked mammal species. Physically, the artifact looked similar to the head of a hammer. The wedge was allegedly taken to the Archeological Institute of Cluj-Napoca to be examined, where it was found to be made of an alloy of aluminum encased in a thin layer of oxide. The alloy of the wedge is composed of 12 different elements. This artifact is considered strange because aluminum was not discovered until 1808 and not produced in quantity until 1885. Aluminium requires 1,000 degrees of heat to be made. The fact that the wedge was found in the same layer of earth as mastodon bones would make it at least 11,000 years old. Many people have claimed that the artifact is proof that aliens visited Earth. Engineers have reported that the object resembles the foot of landing gear, not unlike the technology used on spaceships. The scientific community believes the wedge was made on earth and its purpose is not yet identified. Due to the limited amount of information that exists on the subject, the antiquity and origin of the artifact is unclear. The Aluminium Wedge of Aiud is not on display to the public and remains in an undisclosed location. However, pictures of the wedge do exist. The aluminium wedge of Aiud is often cited as “proof” that aliens visited earth at earlier times, because aluminium was difficult to produce in quantity before 1825. Most scientists, however, believe that this object is a fake. The thickness of this layer is said to be so strong as it would lay over a million years in the ground. The Aluminium wedge of Aiud is often citated as “proof” that aliens visited earth at earlier times, because there were no possibilities to produce Aluminium before 1825.